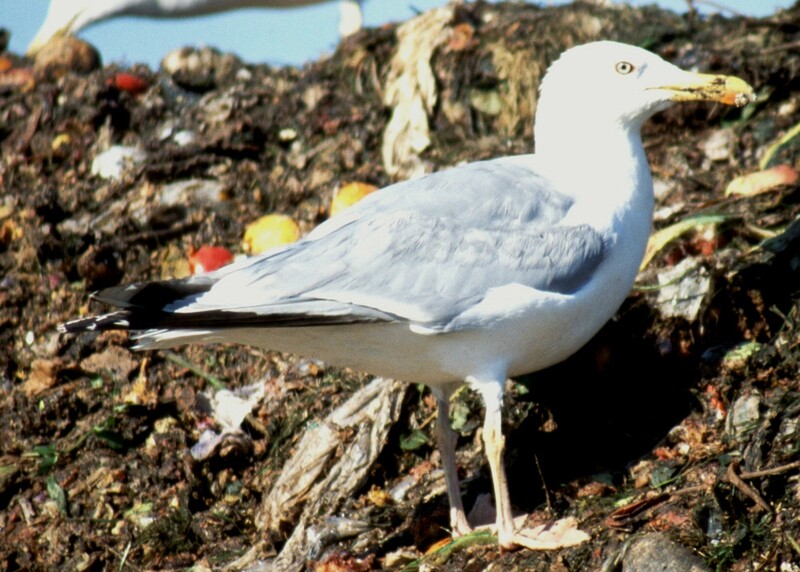 Olsen & Larsson (2003, p.254) give five criteria for separating adult michahellis and argentatus with yellowish legs, formerly called omissus by some authorities. Paraphrased these are: 1) michahellis is more elegant with slenderer hindparts, also structurally argentatus has an evenly rounded head while the head of michahellis is squarer; 2) argentatus has a darker head in winter with coarser markings; 3) fresh primaries in argentatus have larger white tips; 4) argentatus shows more white on P9/P10 and less black on P5; 5) in michahellis, the eye and the orbital ring are darker. 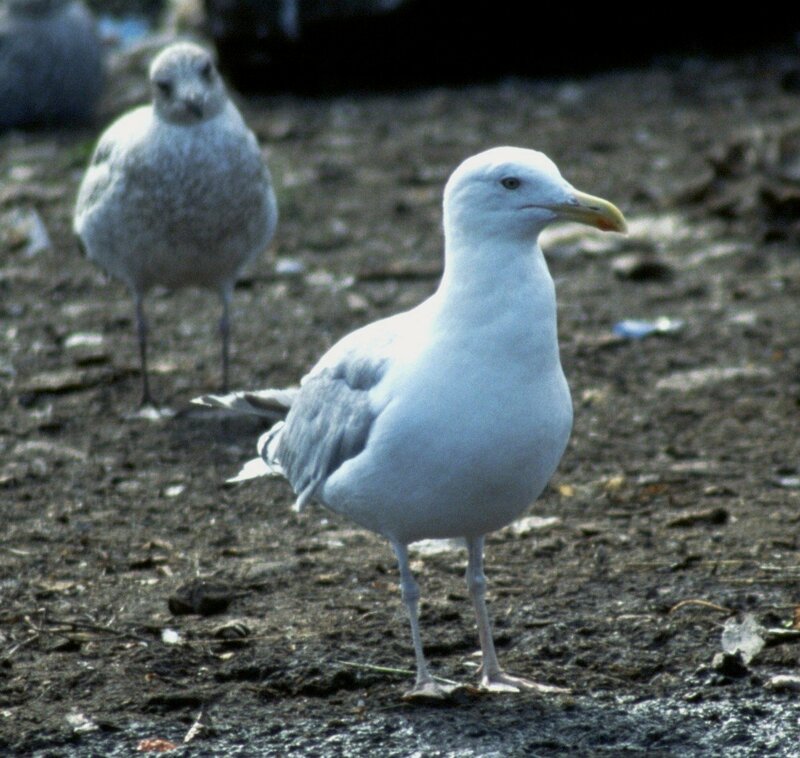 As part of the 6th International Gull Meeting at Lammi, Finland, in August 2002, field trips were made to the Tampere tip and a number of shots taken of the local Herring Gulls. Some of these are shown below together with a commentary. 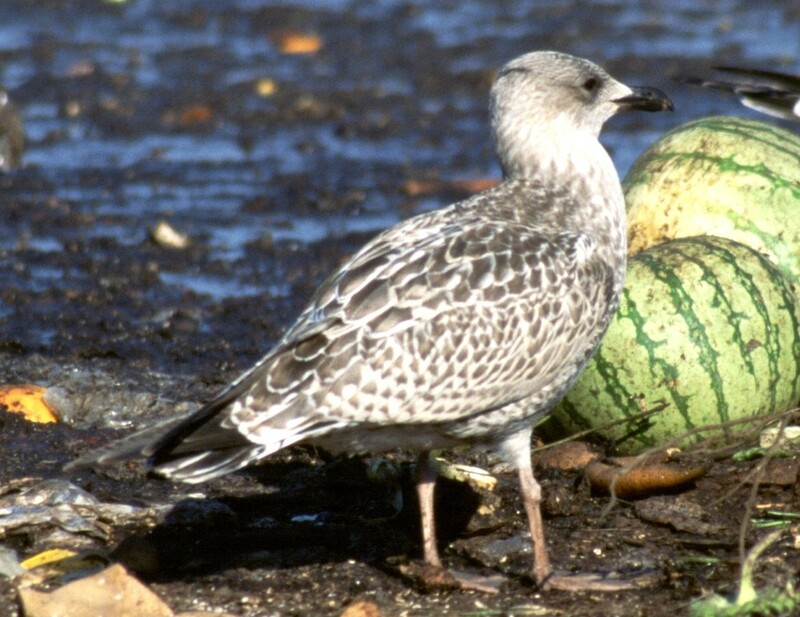 The first comment is that many argentatus here showed pink (flesh) legs as in the populations further west. A number did show pale flesh legs and a further component showed straw or pale yellow coloured legs. None showed bright yellow legs but the frequency of the yellow colouration is evidently very variable . 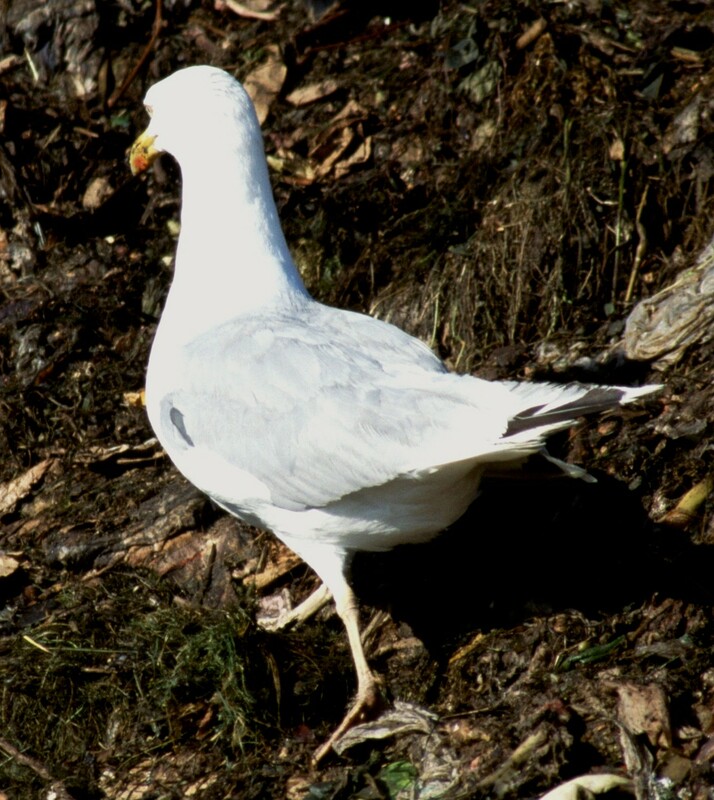 It should be remembered that michahellis can show much less brightly coloured legs in the main moult period. Looking at the photographs below and the criteria above, criteria 1) is useful – yellow-legged argentatus do look more dumpy and the heads are more obviously rounded; 2) does not apply in August; 3) is useful against michahellis which often show quite small primary tips; 4) not really tested in this study with too small a sample, the wing tip patterns of argentatus do clearly vary considerably but the more extreme argentatus with much white and little black in the wingtip are readily identifiable; 5) is useful – eye and orbital ring in many argentatus are strikingly pale. 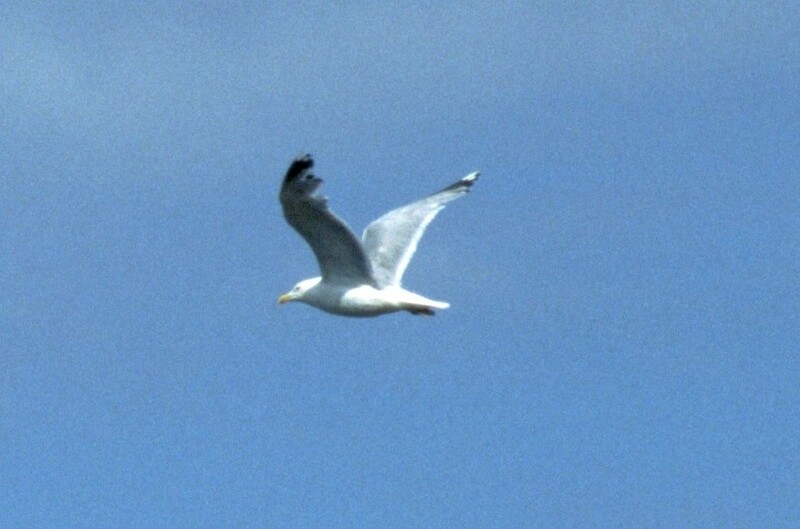 The bills of argentatus in southern Finland are strikingly long with weak gonydeal angle and gentle angle at the culmen; bills of michahellis appear shorter with more marked gonydeal angle and a blunter tip (steeper angle at culmen). 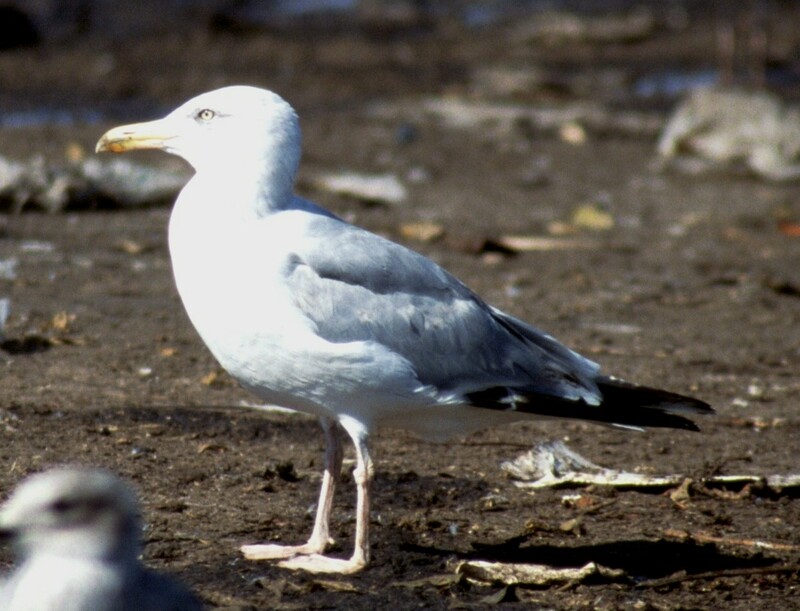 The legs of argentatus in southern Finland are very short, often only about 60-70% of the length of the body above the legs, compared to 80-100% in michahellis. 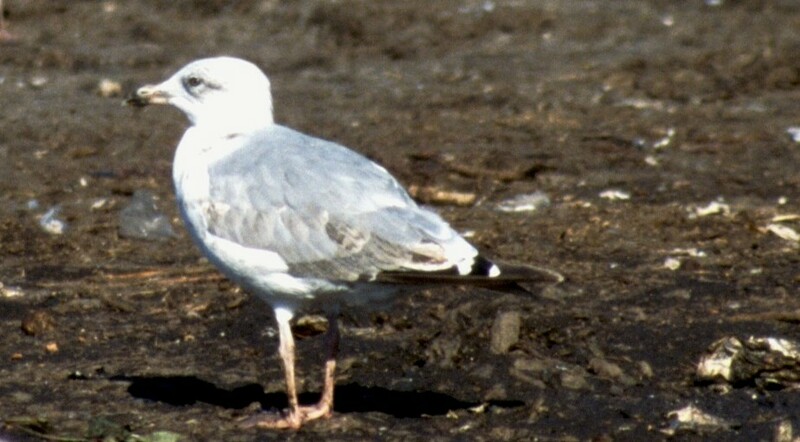 The bills of argentatus in southern Finland carry a smaller orange-red gonydeal spot; michahellis carry a larger redder spot sometimes extending onto the upper mandible. This feature may be inconclusive in some moulting birds when the bill is duller. 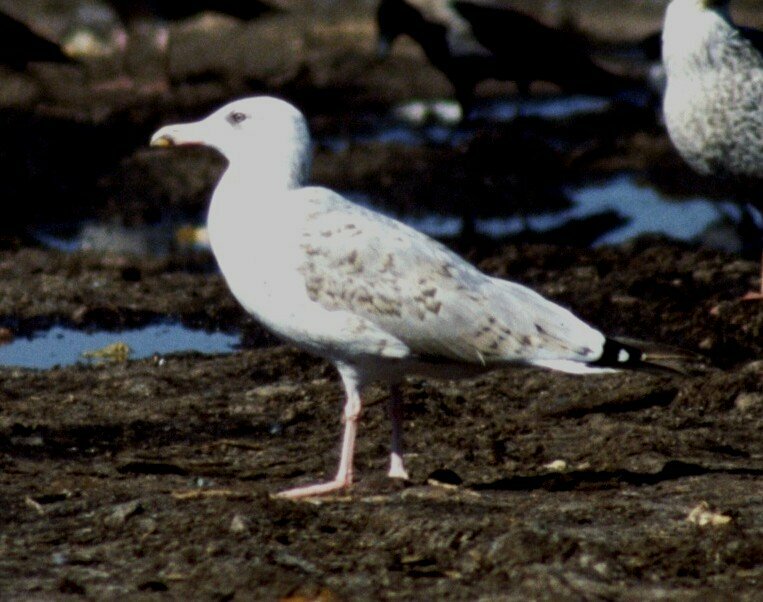 Separating yellow-legged argentatus and michahellis is therefore not so difficult with reasonable views of a number of features; separation on one feature alone is probably not safe when the variation below is considered. Separation from atlantis is more difficult as some of the criteria above are invalid. For instance for 1) atlantis have more bunched primary tips, hence less primary projection; also atlantis often have rounded heads 2) many atlantis have dark heads in winter; 3) Iberian atlantis in particular can show large primary tips; 7) atlantis also always show short legs. 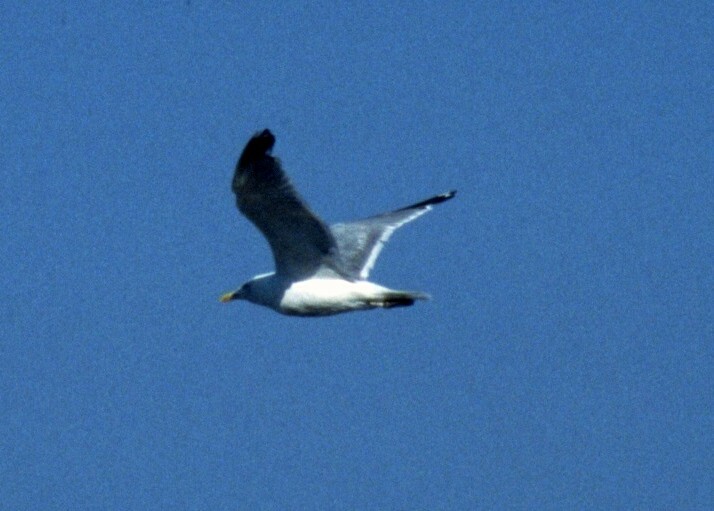 So separation of yellow-legged argentatus from atlantis is more difficult with 4) the wingtip pattern; 5) the colour of the eye; 6) bill length and shape; and 8) gonydeal spot colouration, the best points of difference to study. 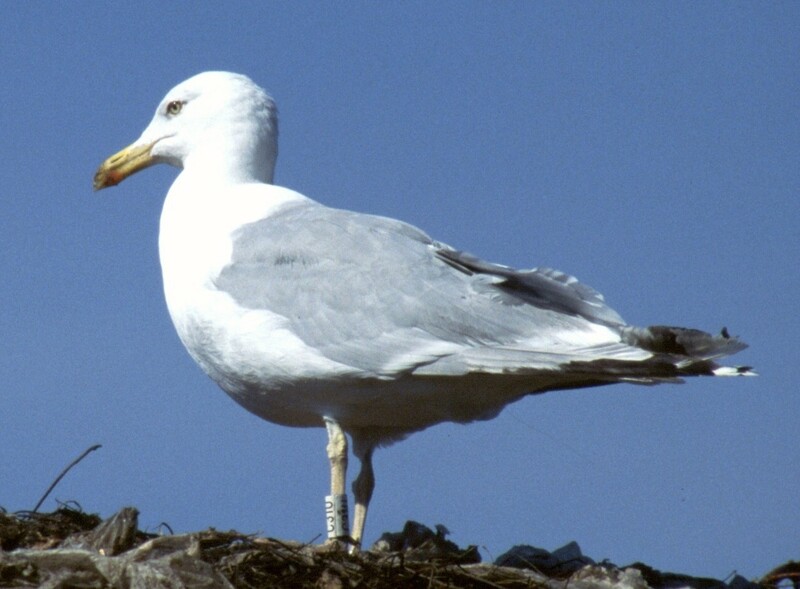 4) is 100% reliable on populations but not on a single bird (except for extreme argentatus as above) and 8) may not be reliable on a moulting bird. 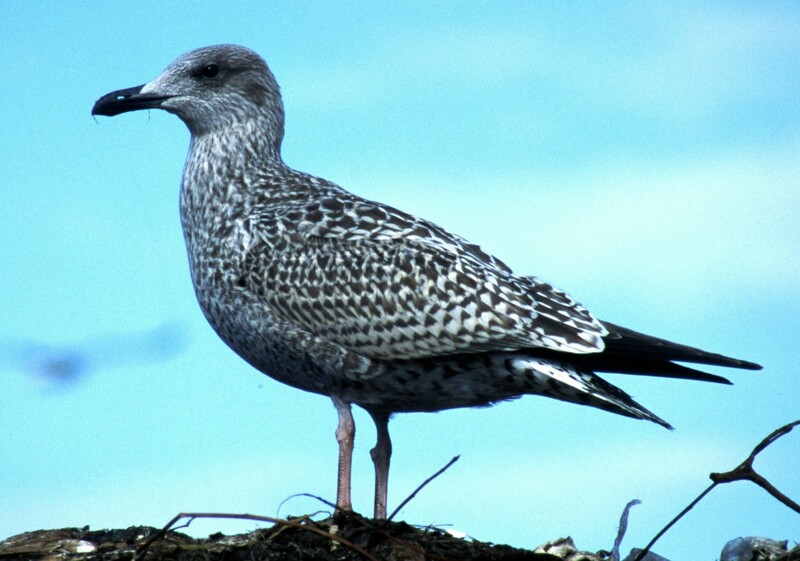 Mantle shades should be useful: atlantis should be significantly darker than argentatus but there may be some overlap. 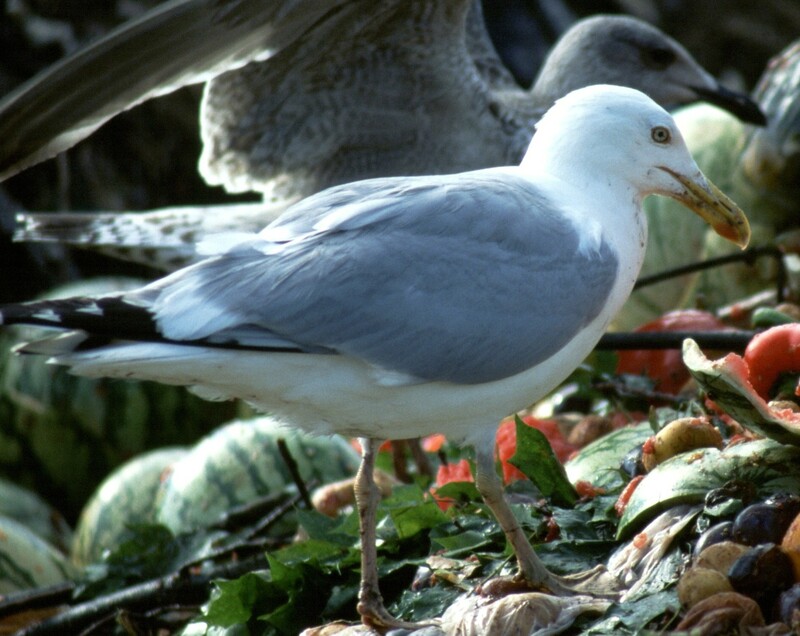 For primary moult first-summer argentatus are up to P8 missing and adults are typically up to P5-P7 missing. For adults this is similar to argenteus in south west England, michahellis in Corsica and atlantis and michahellis in south west Spain. The state of moult is slightly ahead of cantabricans in north west Spain but slightly behind atlantis in the Canaries. An aspect not considered here in any detail is calls: here, many atlantis are closer to argentatus than michahellis. 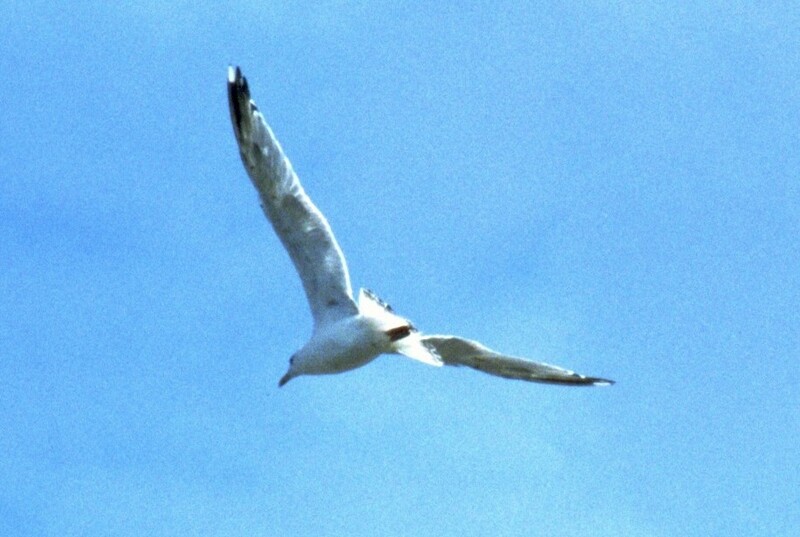 This bird shows an almost complete large white tip to P10, a mirror on P9, an old P8 , gap for P7 and a new P6 with complete black band and large white primary tip. The bill is dull yellow with an indistinct orange gonydeal spot. 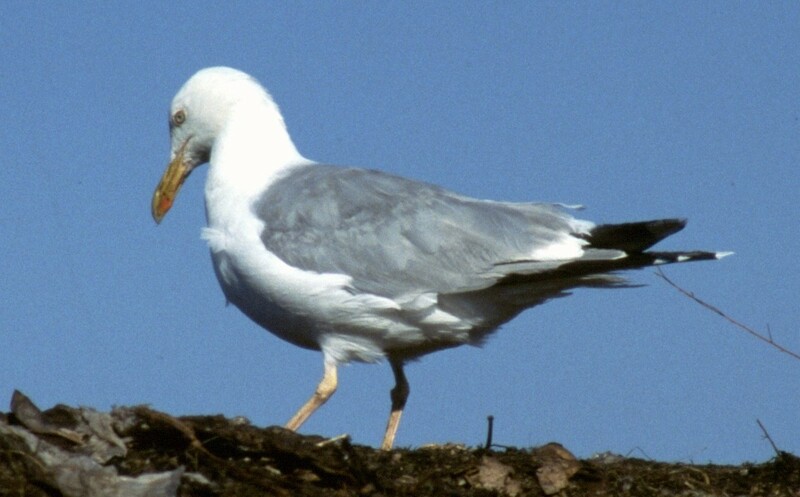 The legs are flesh coloured and the mantle is a fairly pale blue-grey. Structurally the legs are short (but thick), the head is rounded and the bill is long with a slight gonydeal angle and a gentle angle at the culmen. The rear end is more attenuated than in some. The slight grey tinge on the greater coverts might indicate this is a fourth-winter bird. Structurally the legs are short, the head is rounded and the bill is long with a gentle angle at the culmen and virtually no gonydeal angle. The bill is dull yellow with an indistinct yellow-orange gonydeal spot. The very pale eye and orbital ring can be seen clearly. 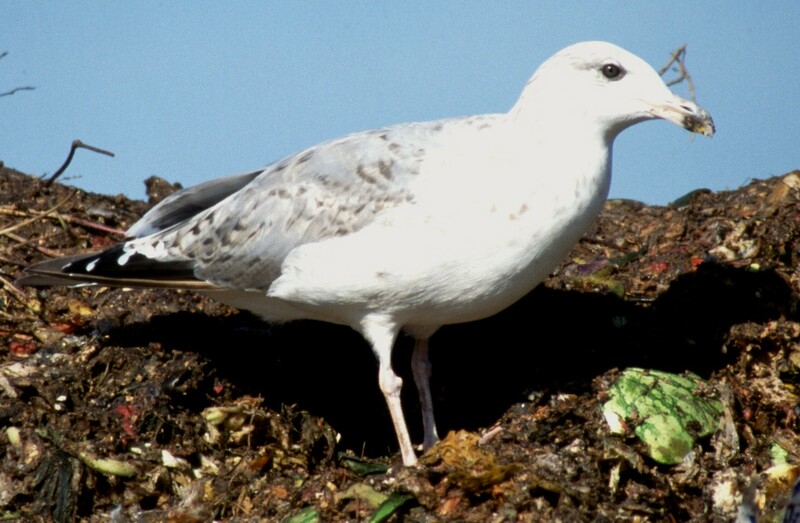 The short legs are flesh coloured and the mantle is a fairly pale blue-grey. The rear end shows limited attenuation. Structurally the head is rounded and the bill is long with a gentle angle at the culmen and very slight gonydeal angle. The bill is yellow with a fairly bright orange-red gonydeal spot just reaching the upper mandible. The eye is pale but the orbital ring is a dark red. 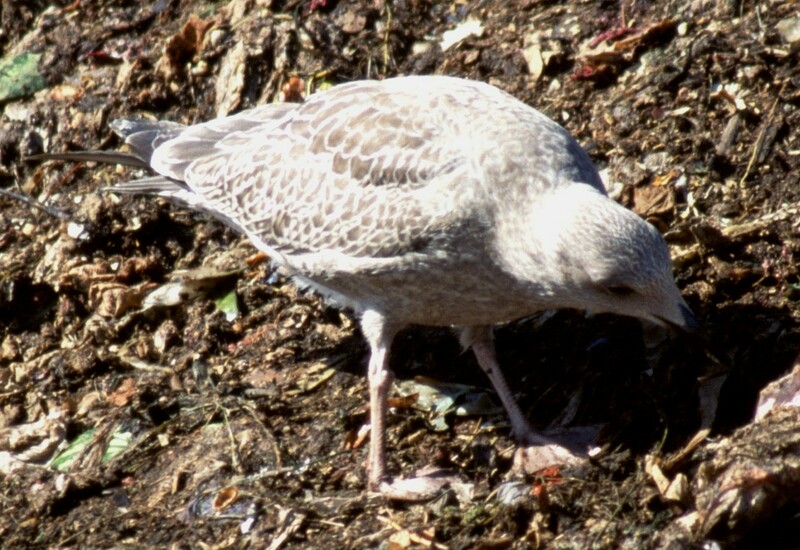 The short legs are flesh coloured and the mantle is a fairly pale blue-grey. The rear end shows limited attenuation. This bird carries a metal ring. Structurally the bill is long with a gentle angle at the culmen and slight gonydeal angle. The bill is dull yellow with a small dull orange gonydeal spot. The eye is pale but the orbital ring is dark. The short legs are a very washed out flesh colour. The mantle is a fairly pale blue-grey. 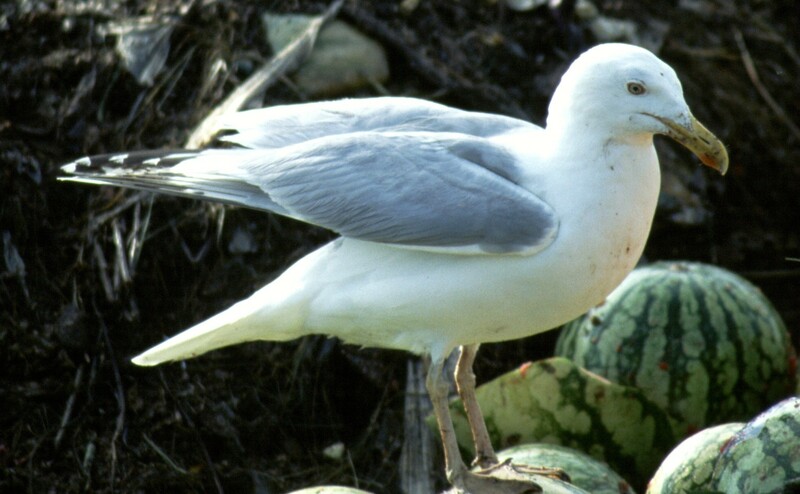 Lower bird, with metal ring, has short legs with a washed out flesh colour. The bill is dull yellow with dark gonydeal spot. The eye is pale. The mantle is a pale blue-grey. The rear end shows limited attenuation. 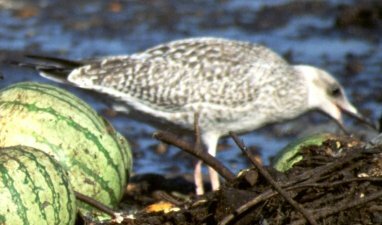 The upper bird shows a square head and a stronger colouration in general to the legs with perhaps a slight yellowish tinge. The bill is very long with parallel sides and the angle at the culmen is gentle. Metal ringed bird. The legs are straw coloured with no hint of flesh. Rather dumpy appearance with only modest attenuation. Legs are short, head is rounded and bill (angle not perfect) shows shallow angle at culmen and weak gonydeal angle. The weak orange gonydeal spot is restricted to the lower mandible. The mantle is a pale blue-grey. 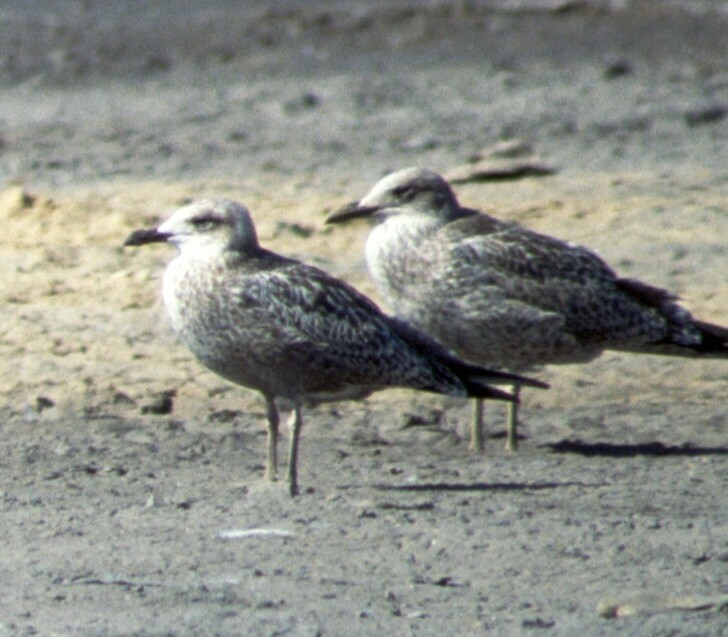 Legs like these on the two birds shown are difficult to describe in terms of colour, but they are clearly not pure pink or flesh coloured – yellowish-pink may be a fair description. The bill of the bird on the left is long, with parallel edges, weak gonydeal angle and gentle slope at culmen. 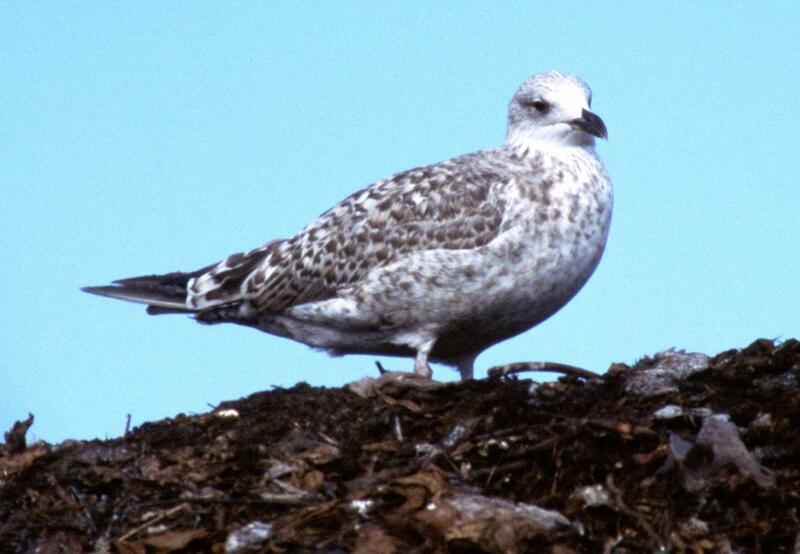 This bird also shows a rounded head and short legs but some degree of attenuation. The bird on the right shows a long straight bill. The bird on the right is a second-summer/third winter with as expected pink legs. 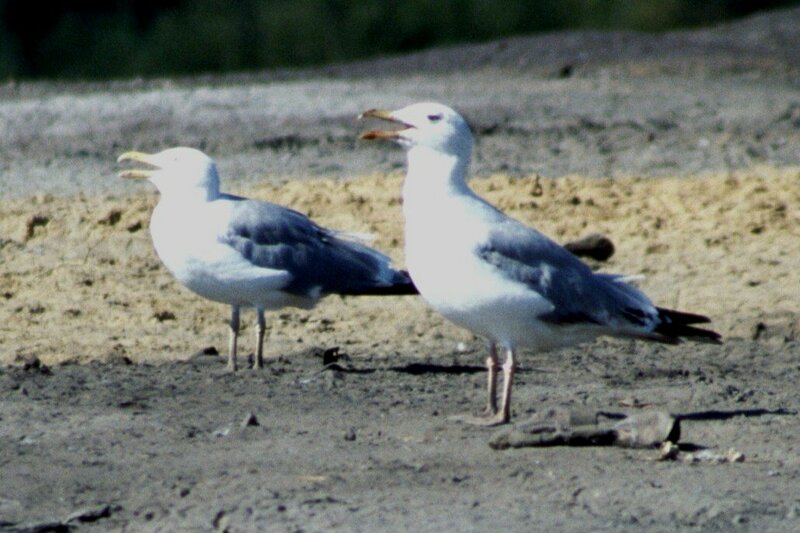 The bird on the left is an adult with short straw-coloured legs. This bird also has a fairly bright yellow bill with obvious dark gonydeal spot, a quite dark blue-grey mantle and a solid head, slightly boxy but with definite peak to crown. It looks quite attenuated but unfortunately the end of the projection is not visible. The legs are a pale straw with perhaps the faintest pink tinge. The eye is very pale with an orange orbital ring. The bill is long with weak gonydeal angle and shallow angle at culmen. The bill is yellow with an indistinct orange gonydeal spot restricted to the lower mandible. The primary tips indicate that feathers up to P7 are new, P8 is missing, P10 (and probably P9) are old. P10 has a complete white tip. The fresh primary tips are not perhaps as large as expected. The rear end is not attenuated. The short legs are a pale straw with perhaps the faintest yellow tinge. The bill is quite a bright yellow with an obvious orange-red gonydeal spot. 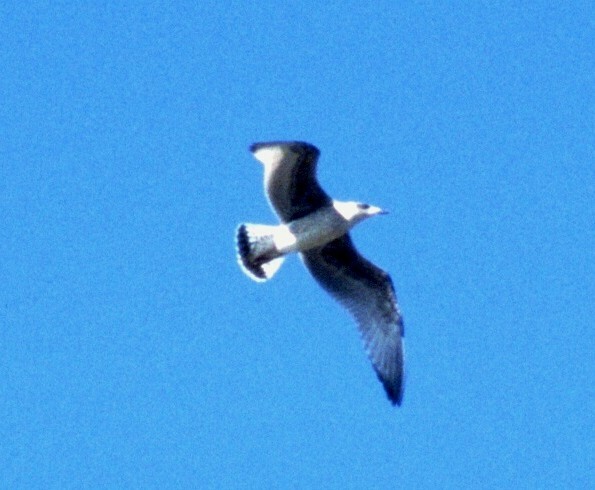 This bird looks quite dumpy, perhaps an effect exaggerated by the angle at which the photograph is taken. The short legs are a pale yellow on the knee joint but more pink below. The eye is pale with a reddish orbital ring. The bill is long with weak gonydeal angle and shallow angle at culmen. The colour of the bill is yellow with a large orange gonydeal spot restricted to the lower mandible. The bird appears to have shed its outer two primaries so looks very dumpy. The short legs are a rather nondescript pale yellow. The bill is long and is yellow with an orange-red gonydeal spot restricted to the lower mandible. The bill is long with weak gonydeal angle and shallow angle at culmen. The eye is pale with a reddish orbital ring. The mantle is a pale blue-grey. Tips to P6 and P7 are large. 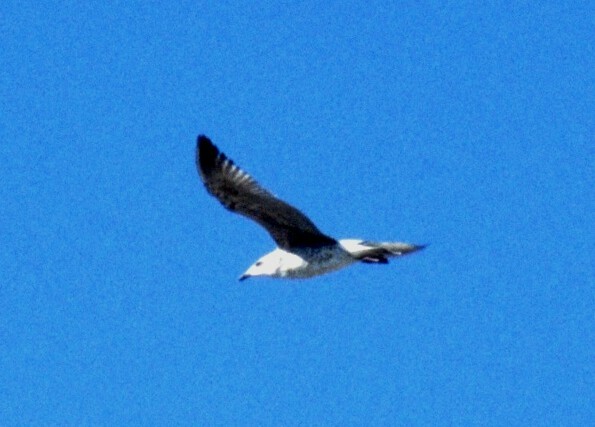 Same bird as above (no. 46). It appears to have P6-P10 old and P5 missing . Primary tips are large. Primary tips are bunched with P8-P10 of similar length. Large white mirror on P10, small mirror on P9, old P8, new P1-P6, P5 no black, P6 some black near tip, gap for P7. Mantle is blue-grey. Large white tip to P10, large mirror on P9, old P8, old P7 some black near tip, old P6 small amount of black near tip, P5 growing with no black apparent, P1-P4 new. Mantle is pale blue-grey. Legs are a washed-out pale yellow colour, straw coloured perhaps. Bill is long with gentle angle at culmen, pale yellow in colour with weak pale orange gonydeal spot. Head is rounded. 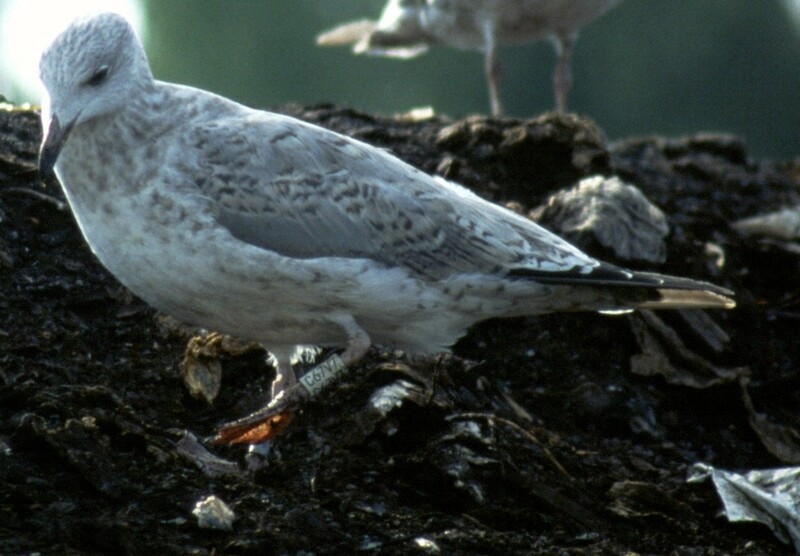 Mantle is pale blue-grey with mottling on coverts. Large almost complete white tip on P10, no mirror on P9, old P8 with extensive black, P7 growing at base showing extensive black near tip, P6 with complete black band, P5 new with black spot, P1-P4 new. Sparse mottling on coverts indicates its immaturity. Short legs are a bright flesh colour. Bill appears to be cluttered up with rubbish from the tip. P5-P6 new. P6 shows a broad complete black band with large fresh primary tip. Outer primaries are old. P7 is presumably growing. Sparse mottling on coverts indicates its immaturity. With new P5-P7, P8 missing. Legs are flesh. Eye is darker than in adults. Bill has small yellow area outside gonydeal spot. Coverts are mottled. With new P6-P7, P8 missing. Legs are flesh. Bill has small yellow area outside gonydeal spot. Coverts are mottled. The black on the bill is in a neat hemisphere, unlike in bird 150 where it is more of a blob. Metal-ringed. Short legs are a bright flesh colour. Bill is black on terminal outer half, flesh-coloured on base. Besides mottling on coverts, breast is extensively mottled with spotting also on belly. Head appears to be slightly streaked. A more retarded bird than 150 or 151. New P5-P7, P8 missing. Two birds. One behind is fuscus juvenile. 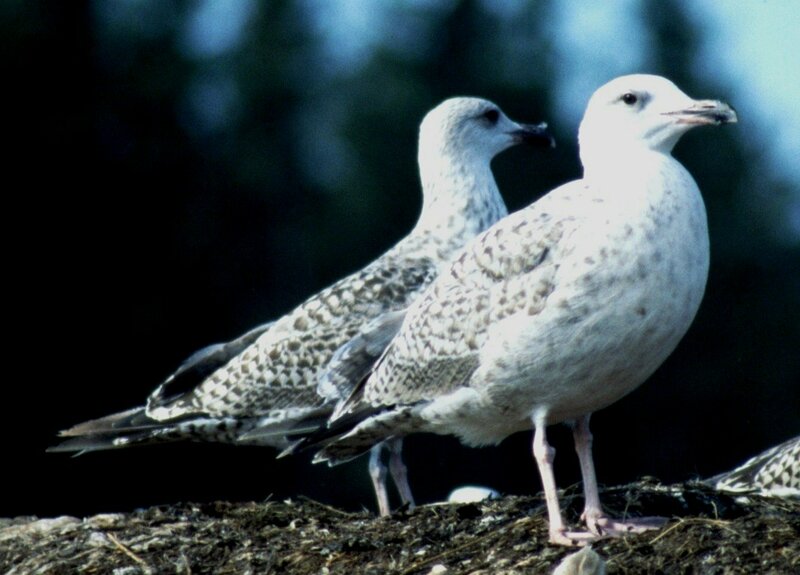 One in front appears to be a retarded argentatus with extensive mottling on coverts, breast and belly. Bill is pink at base and black for terminal half. Short legs are a bright flesh colour. Eye appears to be dark. A dark bird with very well-marked scapulars, mantle and coverts. The scapulars are particularly well-marked. The head and neck are heavily streaked and the breast and belly heavily mottled. The tertials have a large white tip and fringe and a dark oak-leaf shaped centre. The eye patch is very dark. The heavy bill is black with slight gonydeal angle and a gentle angle at the culmen. The heavy legs are flesh-coloured. Brown head, dark eye, coverts well marked with large dark centres particularly on greater coverts. Breast and belly heavily mottled. Tertials with white tip and fringe, dark subterminal bar and dark base. Two birds. 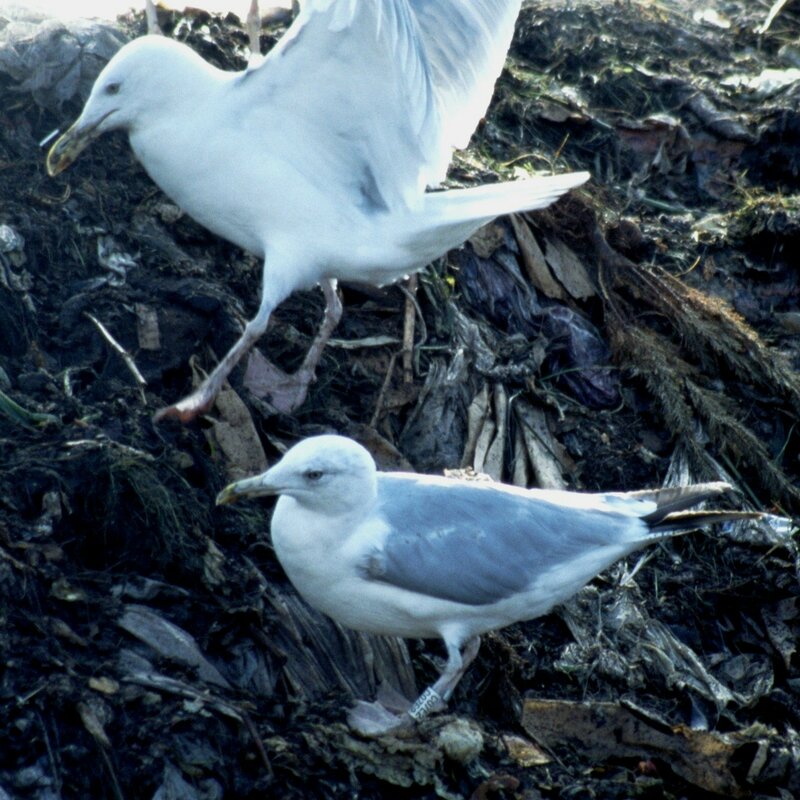 Structurally the one on the right shows some features of Caspian Gull cachinnans with its long black bill with parallel sides and weak gonydeal angle, flat forehead, dark eye patch, straw colour to long legs, tertials with extensive pale tip with dark subterminal markings and heavy dark markings on mantle and scapulars. 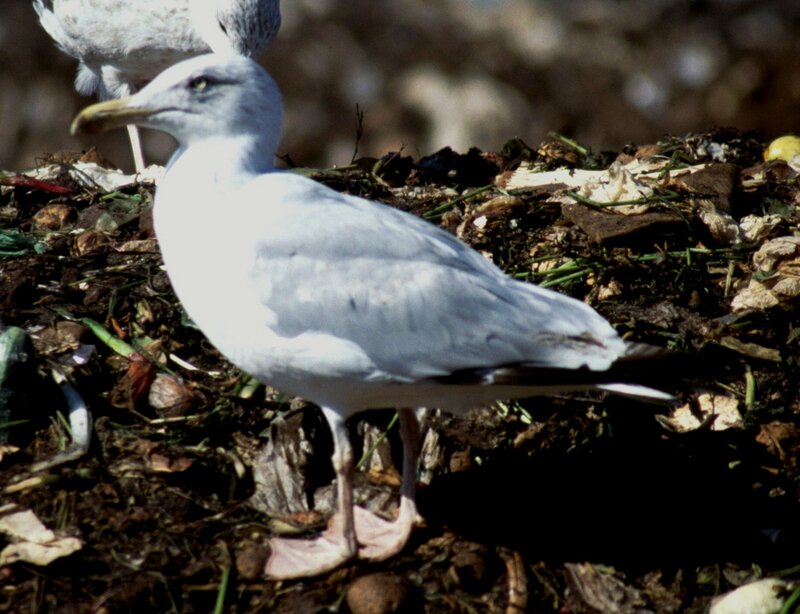 The one on the left is closer to argentatus, particularly in the bill shape which is not so strikingly long and has a more marked gonydeal angle and steeper angle at the culmen. However, its long legs are straw-coloured. Certainly the one on the right shows substantial influence of cachinnans while that on the left shows minor influence. A heavily marked bird on coverts, mantle, scapulars, head and neck. Tertials are white with a brown central area generally narrow but forming a larger diamond shape near the tip. Heavily marked on mantle and scapulars with less heavy markings on coverts. Head is a dark brown-grey. Bill shows small gonydeal angle and a gentle angle at culmen. Short strong legs are flesh-coloured. 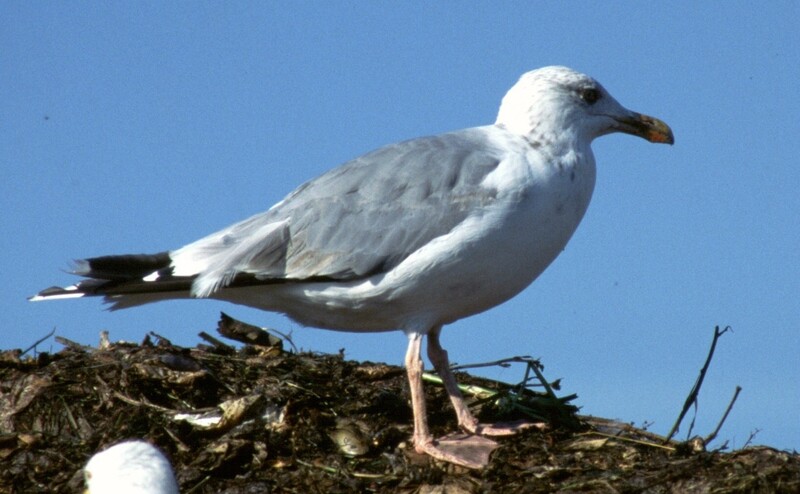 Tertials show white tip, large white fringe and irregular internal brown markings. Another heavily marked bird on mantle, scapulars and coverts. 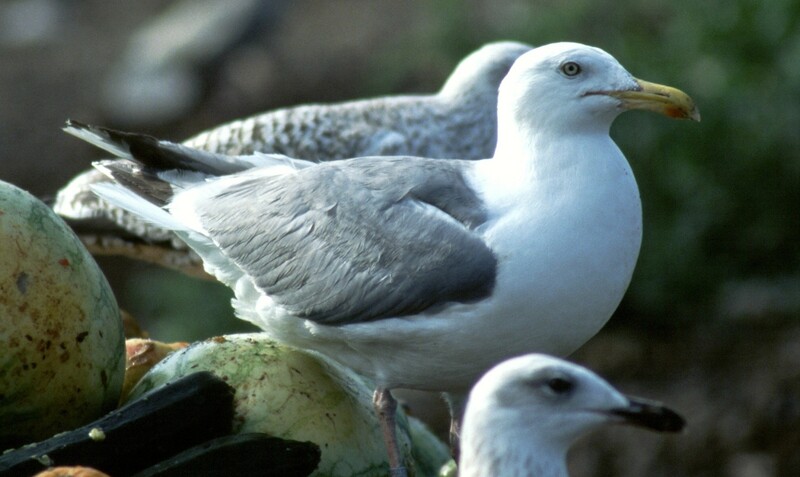 Tertials are mainly white with brown irregular internal markings. Breast and belly are heavily mottled. 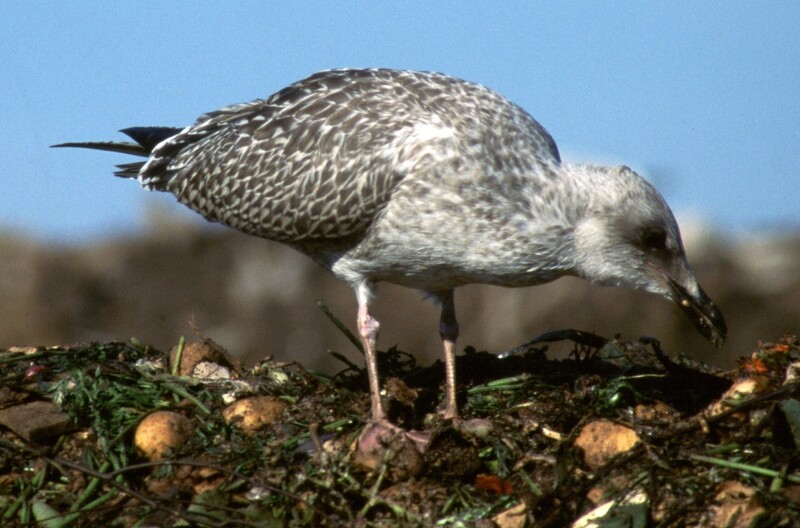 The flesh-coloured legs look relatively long, perhaps because of lack of feathering at the top of the legs. A heavily marked bird on mantle, scapulars and coverts. The neck and head have a heavy grey-brown wash and the breast is heavily mottled. There is a distinct dark eye patch. The black bill is long and parallel sided. The tertials have white tip and fringe and dark oak-leaf shaped centre. The head is heavy. 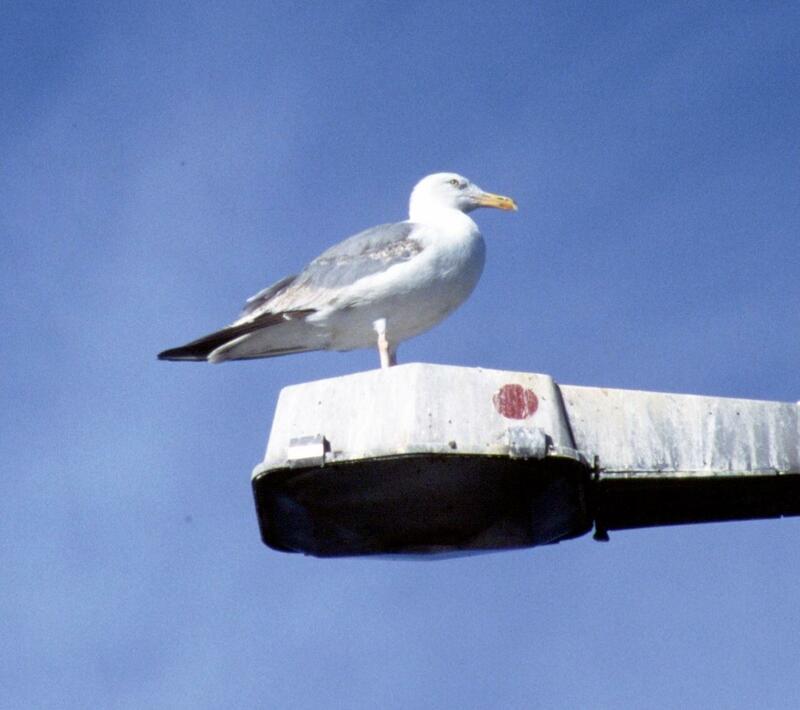 This bird is heavily marked as above. 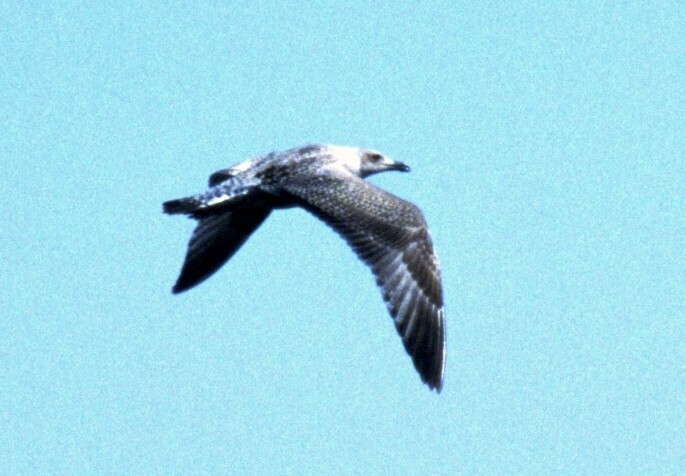 Its tertials are more like atlantis/michahellis with a white tip and large dark brown centre. However, there is also a fairly broad white fringe on this bird. Dark subterminal tail band is fairly broad. 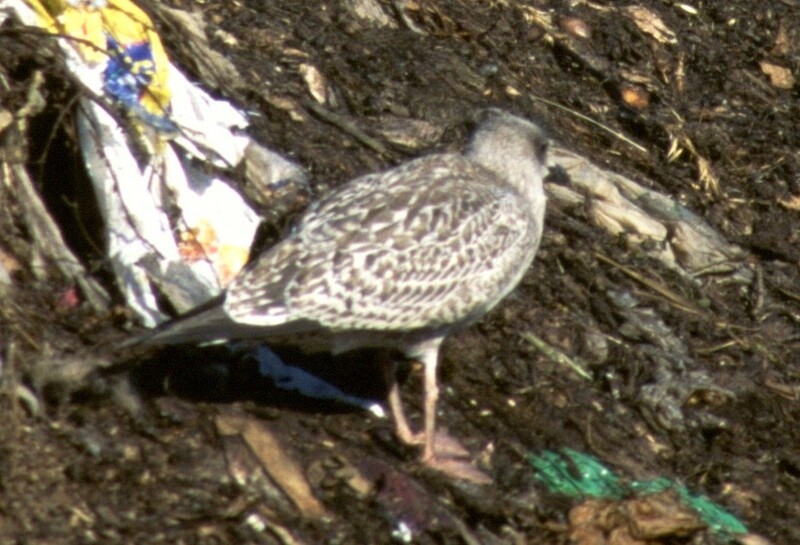 Tail and uppertail coverts are heavily mottled. The pale panel is obvious on the inner primaries. The secondaries and outer primaries are very dark. Again the inner primaries show a clear pale panel. The tail is dark. The bill is all black. The underwing coverts are very dark, contrasting well with the paler inner primaries. The subterminal tail band is fairly broad. The breast is mottled. The undertail coverts are barred. The strong sunlight on this bird is emphasising the paler areas.